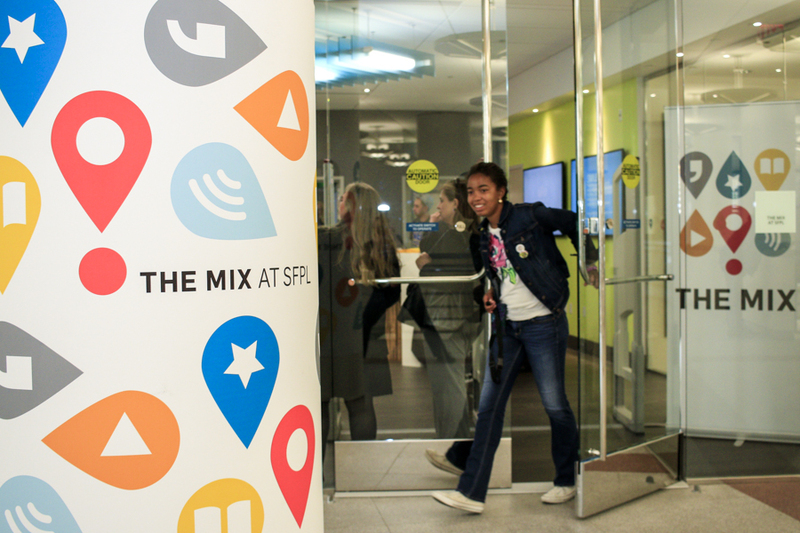 The Mix at the San Francisco Public Library is a teenager’s idea of paradise, with places to chill with friends, be creative and explore technology, as well as room to study and read. 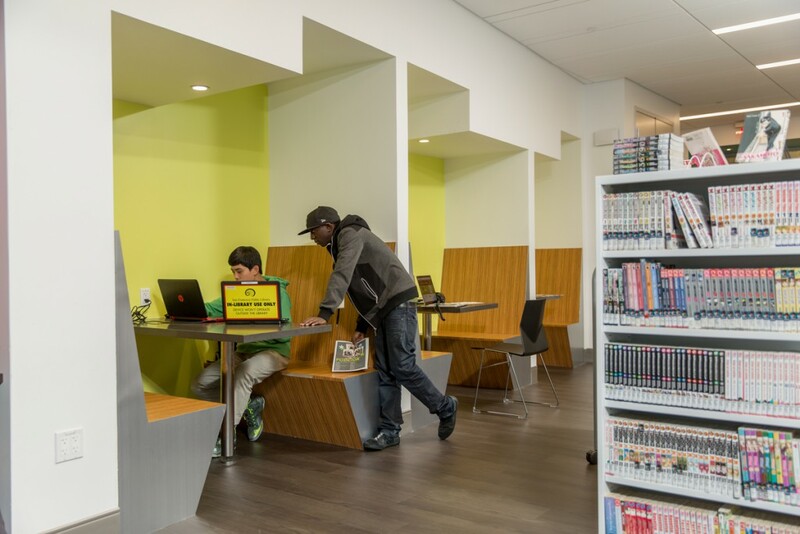 The Mix is based on the learning theory of HOMAGO, providing teens with spaces to hang out, mess around and geek out and allowing them to explore information and technology and design and create. 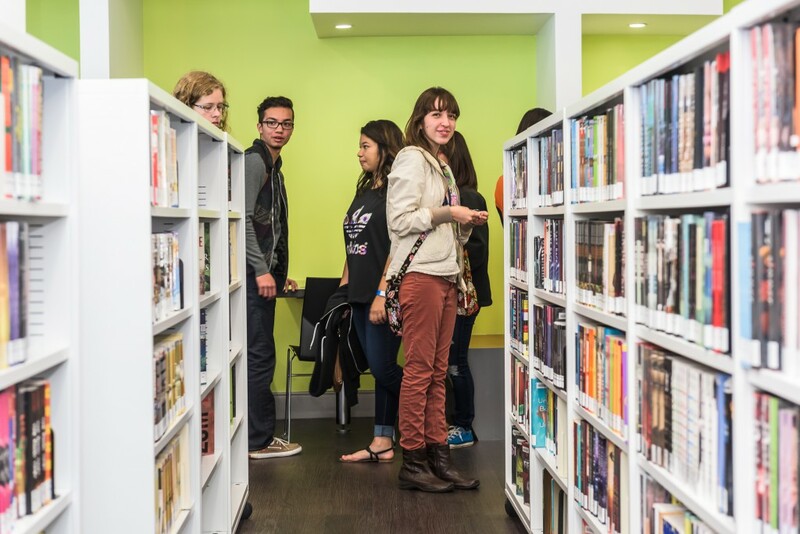 The popularity of SFPL’s teen space can be attributed to the fact that teens were involved in the planning every step of the way. 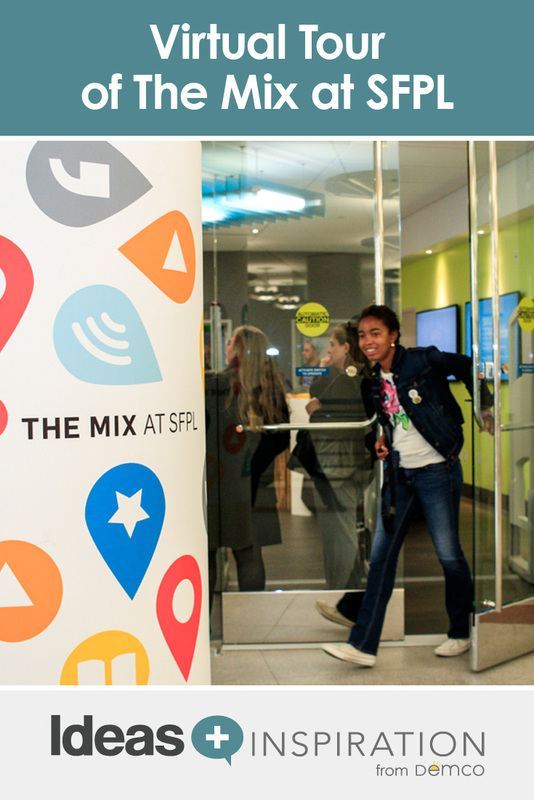 Teens expressed their interests and planners listened; explore the results below as Cathy Cormier, Manager at The Mix, takes us on a virtual tour of the multiple areas that make up SFPL’s teen space. The Mix entrance has comfortable seating surrounded by glass walls. 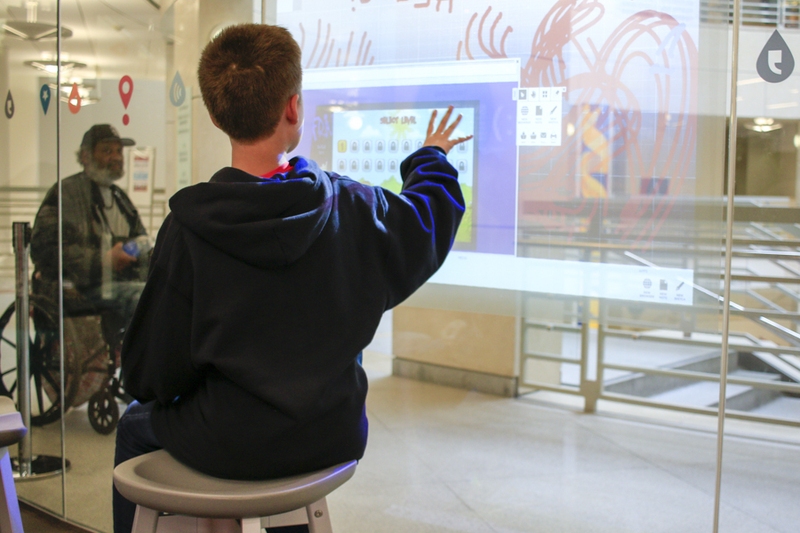 One of these walls features an interactive touchscreen that allows multiple users to interface at one time. The touchscreen is a ThinkHub, created by T1V. A touch-sensitive transparent film is affixed to one panel of glass, and a projector transmits an image from a computer, in this case a Mac mini in an equipment rack. When teens learn that the touchscreen only works from inside the space, they’re excited to know that only they have access to this impressive technology. 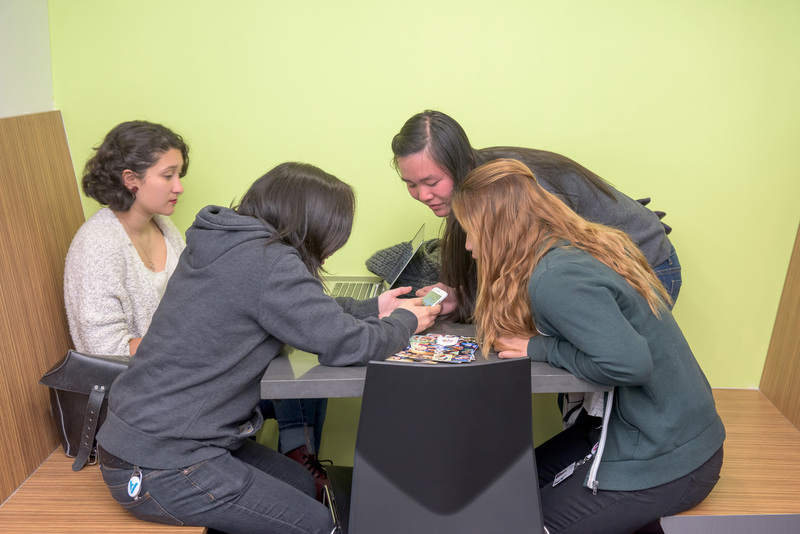 The touchscreen is a great conversation starter, and, like with everything in the space, teens quickly learn how to use the impressive features, including the ability to save images that can be later displayed and modified. During group visits, teens love to call up YouTube videos and sing along, and they have the ability to draw on the videos. The touchscreen is a powerful communication tool. The screen is connected to our Mix network of five integrated screens (located in the Entrance Area, Makerspace, Carpet Garden, Flexible Study Area and Video Booth), so we can use the screen as a display to show films or highlight other programs in the space. 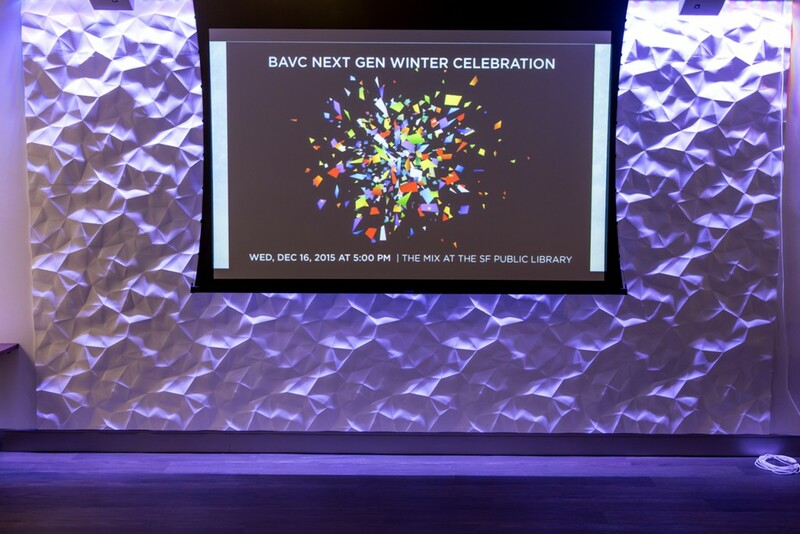 The Interactive Wall has also been used as a presentation tool, like during our recent Civic Hackathon. The Makerspace has a capacity of 5 to 6 people. There are two adjustable lab tables that are set to standing height and six stools of varying heights. There are built-in storage cabinets and shelving, as well as carts that hold our 3-D printers. 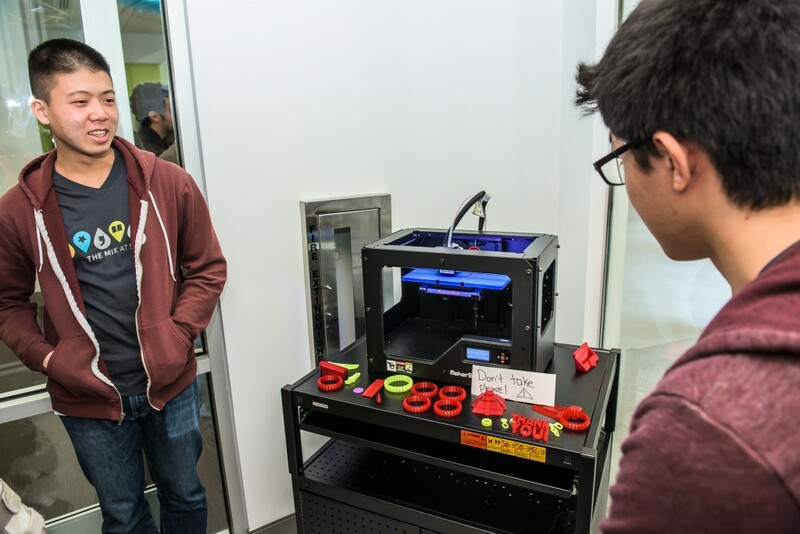 One key feature of the space is that it has doors that can be opened for demonstration programs or closed for programs that generate heat or fumes, such as cooking or 3D printing. There is a built-in exhaust fan controlled by a 30-minute timer switch that we use for programs that generate fumes. There is also a built-in projector and screen, along with computer inputs/outputs so that we can take advantage of online or video instruction when doing programs, which really comes in handy! 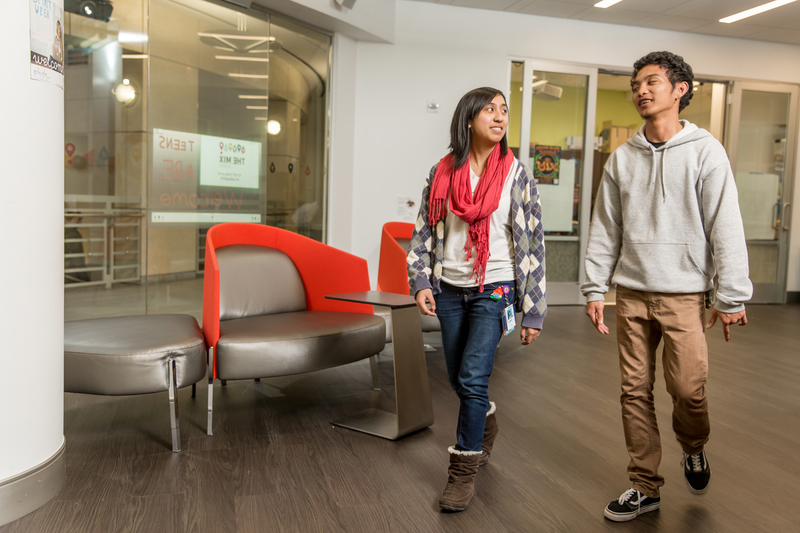 Teens who were part of the conceptual design process of The Mix said that they wanted to have distinct spaces, such as quiet study areas, but they also wanted a place where they could be more relaxed and lounge, which resulted in the Carpet Garden. Like all Mix spaces, the Carpet Garden is multipurpose: it serves as a lounge with amphitheater-style seating where teens can hang out and charge their devices using the many outlets, but it also serves as a performance space, presentation space, meeting space and teaching space. 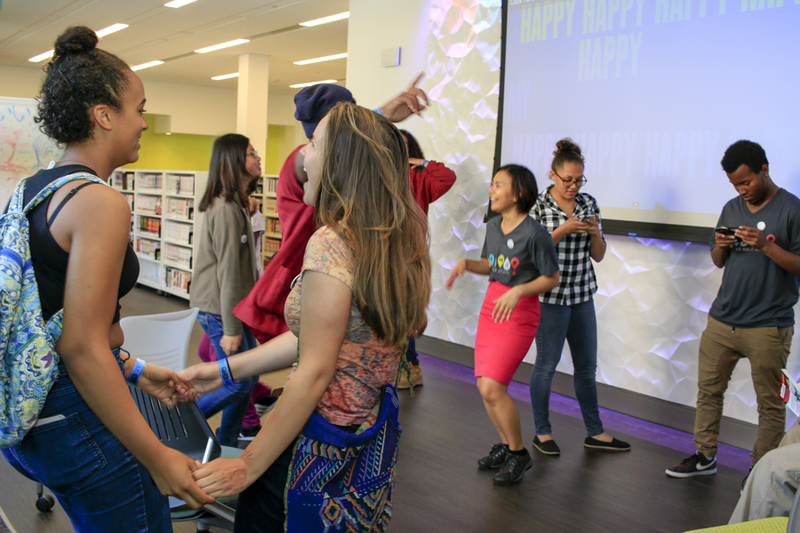 Weekly programs include spoken word open mics, presentation panels and the two most popular programs, group gaming and Just Dance! 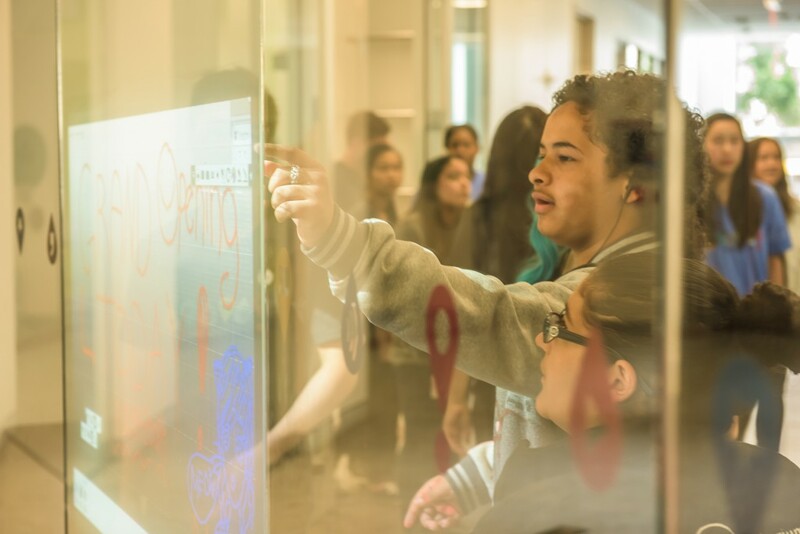 Once teens learn about the space, they call us and say, “I want to have my dance group’s performance in this space,” or “I want to have my robotics club program in this space,” and we help them schedule the programs. The Carpet Garden can be separated from the Flexible Study Area with a modular glass panel, which creates two distinct soundproofed spaces. We were fortunate that two of the teens involved in the conceptual design process were invited to speak at the Digital Media Learning Conference in 2013 in Chicago. While there, they visited YOUMedia Chicago, the flagship digital-media learning lab for teens at the Chicago Public Library that became one of our inspirations. This trip happened in the midst of the design process, and the teens came back with invaluable feedback for the project designers. The most important feedback was, “Wow, it’s so loud, there’s no differentiation between all of the spaces.” This resulted in a project design that included flexible yet distinct spaces that have sound barriers wherever possible. We heard the desire for flexibility in spaces and seating throughout the design process, and, as a result, there are various types of seating and study areas throughout The Mix, with an eye on modularity and flexibility. The bookshelves are all on wheels so that they can be moved as needed for special events. 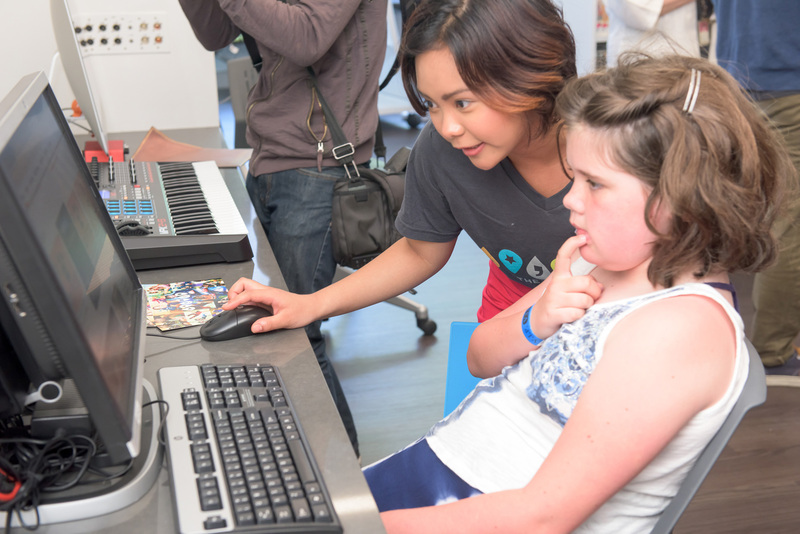 For example, during our recent Nintendo Mario Maker program, The Mix was transformed for a day with computer design kiosks. The bookshelves are adjacent to the Flexible Study Area, which has moveable tables and chairs that can be configured in various ways to accommodate group projects, test-prep workshops or general study needs. At the east end of The Mix is the Nook Wall, a series of three booth seating areas of different sizes: a nook that seats 4 to 6, a nook that seats 2 to 3 and a solo nook (the most highly sought after of the trio). The Computer Station is a bank of six 27-inch iMac computers designed for digital media work and instruction. 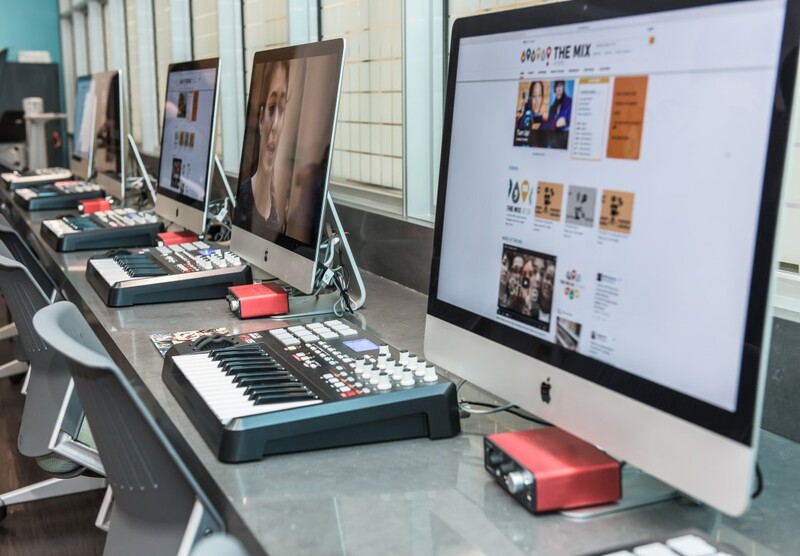 These computers are frequently used by teens who take drop-in audio and video classes, and they’re also used independently by teens working on various projects. We also have a computer laptop lending kiosk adjacent to the bank of computers from Laptops Anytime that has HP laptop computers and iPads that can borrowed by any teen with a library card and used anywhere in The Mix. 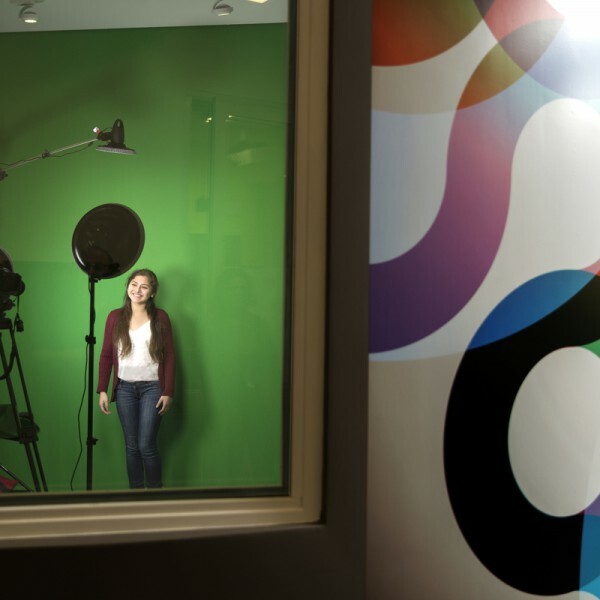 The Audio Booth is a soundproofed studio, which is nearly professional grade, with capacity for 6 to 8 people. 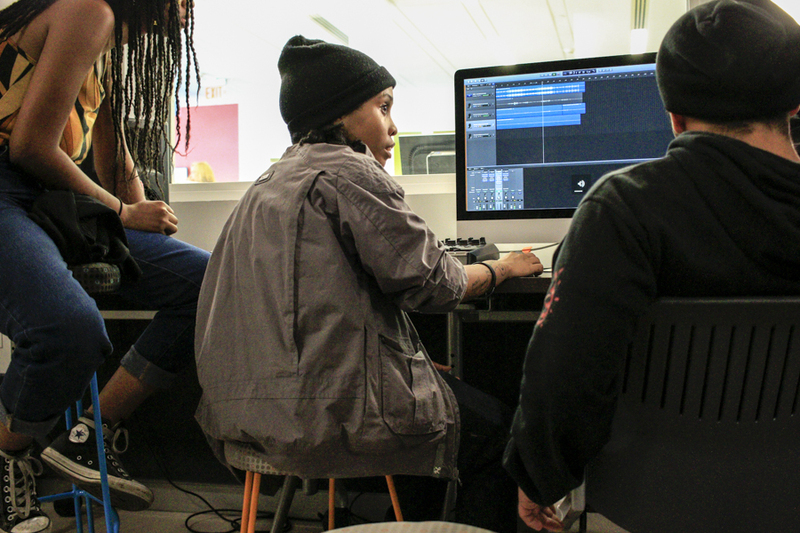 The experienced instructors that teach in the audio studio say that the space is comparable to professional audio studios that rent for $200 an hour, so we’re very excited to offer the Audio Booth as a completely free resource to teens in the community. There are audio inputs and outputs to an outside computer that sits adjacent to the space for mixing and remixing, which allows the studio to be a pure recording space. The space also features a storage closet for extra gear. 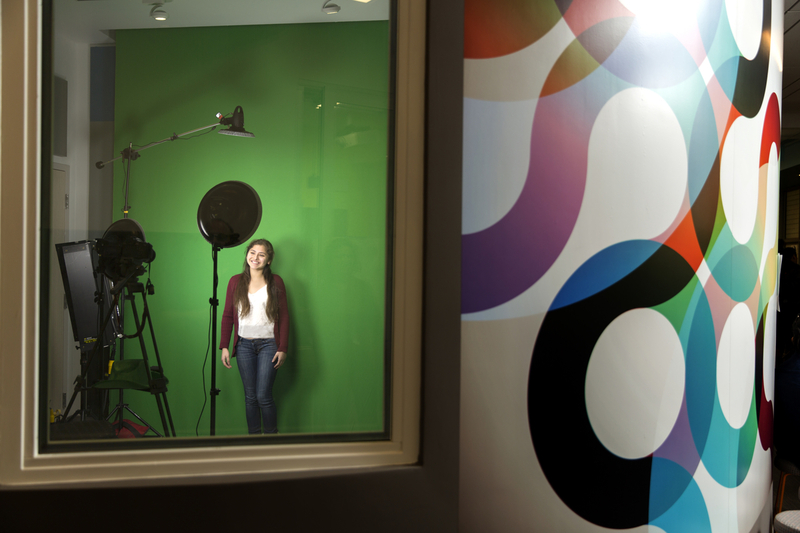 The Video Booth is also a soundproofed studio space with capacity for 6 to 8 people. This space has a built-in, drop-down green screen, video playback monitor and inputs/outlets for audio and video equipment. There is also a storage closet for extra gear.